CryptoFinancial ransomware uses sophisticated techniques to infiltrate computers and hide from its victims. Use Reimage to determine whether your system is infected and prevent the loss of your files. What protection is sufficient to fend off ransomware viruses? If your computer is stacked with important information, work files, music or precious memories from your family holiday, the CryptoFinancial virus infiltration can turn your life into a living nightmare. From a first sight, this program is identical to the majority of other ransomware infections. It sneaks into or enters the computer by deception, encrypts the data with and sends a note explaining the whole situation. This note also indicates the amount of money needed to recover the data, as well as more detailed file recovery directions. 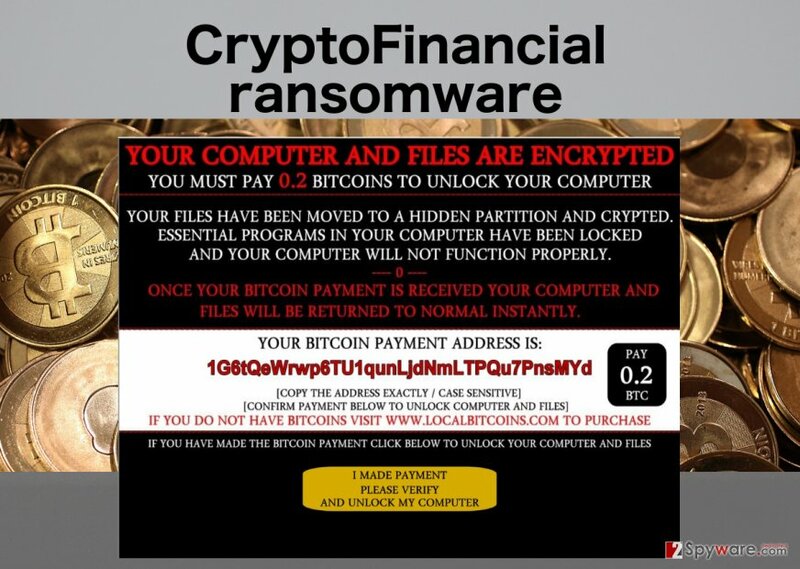 Unfortunately, it is not common for the ransomware creators to keep their word and often even after paying the ransom the files remain encrypted. 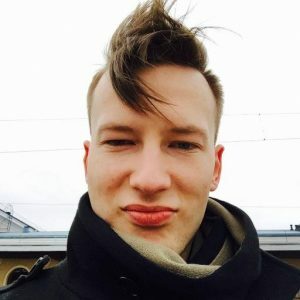 Nevertheless, while such ransomware viruses leave the encrypted files on the computer, CryptoFinancial simply deletes them. That is why this virus can be especially dangerous and even fatal to your files. Thus, it is crucial to terminate this virus at the earliest stages of infection or, even better, to prevent it from entering your computer in the first place. CryptoFinancial removal should be quick and precise to avoid further damage to your files. You can trust Reimage for this task. There are several ways to recognize the CryptoFinancial infection. Seeing the ransom note pop up on your computer screen is the most obvious one. If it does not indicate the virus name, pay attention to its content. The note will disclose that your files have been encrypted and moved them to some “hidden partition.” Also, it will warn you that not only the files but also the most important programs on your computer are now encrypted, and you will not be able to use them until you pay up. Even though the 0.2 BitCoin fee these criminals demand transferring to their anonymous account is not that large, we do not recommend doing that. The hackers will promise that “your computer and your files will be returned to normal instantly”, but as we have already mentioned, most probably they will delete the files as soon as the payment is made. So, if you still lose your data regardless of whether you pay to recover your data or not, isn’t it just better to remove CryptoFinancial from your computer and make sure it is safe to store new files on it? Currently, there is no method which could ensure a 100% protection against malicious viruses like CryptoFinancial. Of course, you can use layered protection, using firewalls, reputable antivirus software and regular system updates, but the most important step in the data protection are backups. To keep your important data protected it is not enough to store it on some online cloud and hope for the best. Ransomware viruses are usually capable of infiltrating storage clouds using your network and encrypting data there as well. Thus, you should have your most essential files regularly transferred to remote storage drives, such as CDs, DVDs, USBs or external hard drives. Remember, that it is important to unplug these drives from the computer once the transfer is done. Otherwise, you may find that CryptoFinancial has locked these drives, too. There is no tool for the CryptoFinancial decryption, nor can this virus be removed without consequences, once infected with it. You can delete it with automatic antivirus software, such as indicated below. In case the virus has blocked your virus-fighting utility, or you face some other difficulties with CryptoFinancial removal, you should follow the instructions provided at the end of this article and run a scan of your system again. When you are sure that the virus is eliminated and the encrypted files are still on your computer, you can try decrypting them with file recovery software such as PhotoRec, R-Studio or Kaspersky virus-fighting utilities. If you cannot remove CryptoFinancial, do not hesitate to contact us and we will try to find the best solution. Log in to your infected account and start the browser. Download Reimage or other legitimate anti-spyware program. Update it before a full system scan and remove malicious files that belong to your ransomware and complete CryptoFinancial removal. When a new window shows up, click Next and select your restore point that is prior the infiltration of CryptoFinancial. After doing that, click Next. Once you restore your system to a previous date, download and scan your computer with Reimage and make sure that CryptoFinancial removal is performed successfully. This entry was posted on 2016-07-11 at 03:25 and is filed under Ransomware, Viruses. You can quickly scan the QR code with your mobile device and have CryptoFinancial ransomware virus manual removal instructions right in your pocket. How did you remove CryptoFinancial virus?